Should I study in Canada? Trying to decide where to study? It can be a tough decision to make – especially if you’re moving to another country. With so many amazing locations to choose from, how do you pick just one? Canada is a popular choice for international students from all over the world. Thousands of international students decide to begin their higher education in Canada every single year. Are you asking yourself why you should study in Canada? We’ve got 10 great reasons to do just that. The Global Peace Index lists Canada as one of the top 10 safest countries in the world to live and visit. Canada has low crime rates relative to other parts of the world and the country is known for its friendly and welcoming citizens. Universities in Canada also have a strong focus on student security and safety. Unlike neighbouring USA, Canada has a national healthcare system that is provided to all its citizens. For international students, cover varies from province to province but where you’re not covered, private medical insurance is pretty inexpensive. Despite the comprehensive coverage and the cheap cost, Canada’s health services are some of the best in the world. One of the benefits of studying in Canada is that tuition fees are incredibly low compared to other English-speaking countries. Despite the low fees, Canadian universities are recognised in world university rankings as places of academic excellence. Canada is such a large country and that means it’s made up of beautiful coastal towns, scenic national parks and vibrant cities. There’s definitely something for everyone’s taste. Canada benefits from four distinct seasons so you get to experience both sunshine and snow! Depending on which city you’re in will depend on the type of weather you get in each season. Canada is very varied! You’ll find all kind of cultures, customs and traditions in Canada as a range of different ethnicities and races reside here. As well as thousands of international students heading to Canada to study every year, the country is also home to over one million aboriginal people, including First Nations, Métis, and Inuit communities. There’s even a national policy for multiculturalism! In Canada you can choose from over 15,000 undergraduate and graduate degree programs that cover such a diverse range of disciplines. All these degrees are internationally recognised around the world. Canada is one the most picturesque countries in the world. Whether you want majestic rocky mountains, placid lakes, sprawling fields or modern skyscrapers, Canada has it all! It’s also has some of the cleanest cities in the world! There are two official languages in Canada: English and French. There are a wealth of language courses and training programs available to international students who want to brush up on either their English. French or both before they begin their degree course. If you already know one of the languages, you can add another to your repertoire. Looking at things such as life expectancy, educational facilities, healthcare and general quality of life, Canada has been ranked by the UN as one of the best places in the world to live. 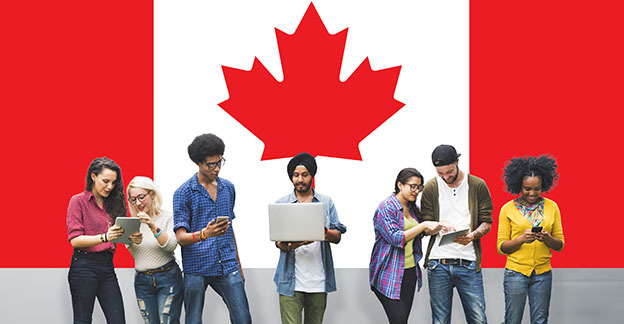 International students in Canada are permitted to work on campus whilst they are studying without the need for a work permit. After graduation, international students currently have the opportunity to live and work in Canada for up to a year. Then they must apply for permanent residency if they wish to stay. It’s worth keeping up to date with the rules and regulations as they can change quite frequently. So what are you waiting for? Thinking of studying abroad? Let us help you apply for the Canadian university of your choice!